Luis Suarez scored a second-half equaliser for Uruguay in a 2-2 draw with Brazil, his first competitive international since he was banned for biting at the 2014 World Cup. The Barcelona striker had not played competitively for Uruguay for 640 days before Friday's World Cup qualifier. Douglas Costa scored for Brazil after 39 seconds before Renato Augusto doubled their lead on 26 minutes. Edinson Cavani pulled one back before Suarez struck just after half-time. Suarez, who captained the side at the Itaipava Arena Pernambuco, bit Italian defender Giorgio Chiellini during Uruguay's final group match of the World Cup on 24 June 2014. He was given a nine-game ban from competitive internationals, as well as a four-month ban from all football-related activity. The former Liverpool forward missed Uruguay's subsequent World Cup defeat by Colombia, the entire 2015 Copa America and four games of qualifying for the 2018 World Cup. Uruguay are now second in South American qualifying, three points behind leaders Ecuador, while Brazil moved level with Argentina and Paraguay in third place with eight points. 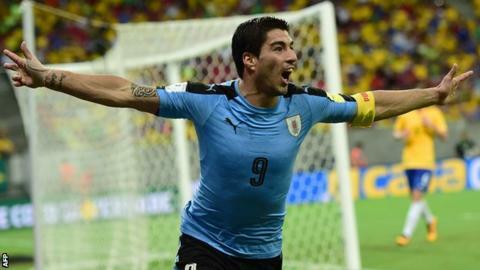 Read more on Luis Suarez: Has Uruguay and Barcelona striker gone from villain to hero?